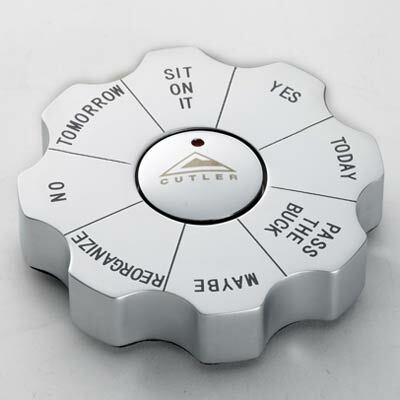 Personalized Executive Games "Spin Decision" Custom Engraved in Bulk. Promotional, Inexpensive. Best price in America. High quality, yet inexpensive Spin Decision Executive Game in bulk, customized with you logo. We also supply blank (not personalized) Spin Decision Executive Game for $13.95 each (minimum quantity: 25). Free artwork design and Free proofs! American clients pay no taxes. The unit prices below include your custom laser engraving. We also supply blank (not personalized) Spin Decision Executive Game for $13.95 each (minimum quantity: 25). Have some fun and take a spin! This solid metal executive game is fun for all!!! Item comes in a black matte gift box measuring 1 x 4.75 x 4.75. Imprint Area: .5" H X .75" W. Unless otherwise specified on your P.O., we will imprint in the direction shown here. Packaging: Gift box, 40 units per carton, 35 lbs. per carton.